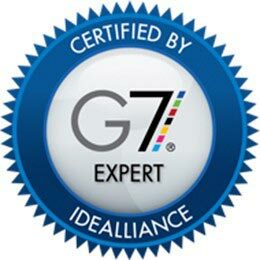 G7 Expert – Indy Imaging Inc.
G7 means you can expect consistency from our color setup. You know that we have tested and verified our systems and are within tolerance. However, we must remind you, technology and materials change rapidly. We will match any color within industry standards(<6deltaE) and do whatever it takes to make sure you are a happy customer. We have multiple G7 experts onsite.